We want to thank Acme Markets for sponsoring this post. The opinions written within are all mine. It’s that beautiful, amazing, exciting time of year to eat, drink and be merry! That’s right it’s almost time for the holidays. And that means time to start planning and shopping for those holiday menus. I love it! With so many delicious dishes to choose from it can sure get overwhelming though. Are you the type that stays true to tradition bringing back your family’s favorite dishes every year? 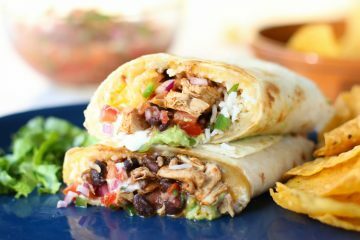 Or do you like to spice things up trying new recipes and flavor profiles? I think I like to do a little of both. But whatever I decide to serve during the holiday season there is one thing that remains. You have to have some yummy holiday treats. And it doesn’t have to be hard or take tons of time. And it can be made with delicious, high-quality organic ingredients. Oh, and you can even package it and give it as gifts. So what is this super amazing and delicious holiday treat that I speak of? 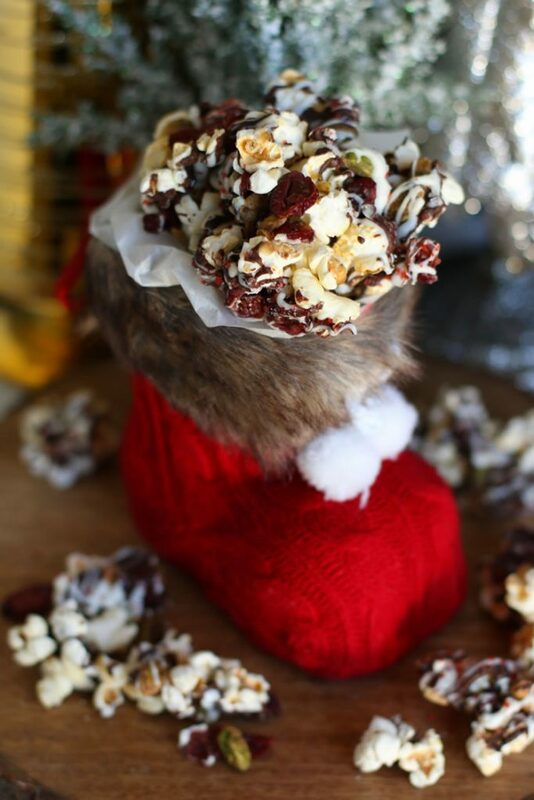 Holiday Kettle Corn Bark. We recently visited the Acme Markets Culinary Kitchens and Technical Center for some amazing holiday food and entertaining inspiration. We learned some great tips and tricks for holiday the season and saw how easy it can be to spruce up your holiday table all in one stop to your local Acme. We had so much fun cooking in their kitchens and were challenged to create some delicious holiday dishes. Think Chopped without all the pressure. We also learned so much about their signature organic and natural ingredients like the ones we featured in this versatile holiday recipe. Natural and organic food is really the way to go. I think we can all get on board with that. And over ten years ago Acme launched its own O Organics® line with the philosophy that organic foods should be easily available to more people at a great value. All O Organics products are non-GMO and USDA certified organic (95%+ organic ingredients). And you can find all kinds of things from produce to dairy, cereal to snacks, meats, coffee, tea and tons more. It’s also currently the most popular and best selling organic brand in the country with over 400 organic products in store! How cool is it that you can shop there and fill up your entire cart with organic foods and not have to go to 20 other stores to get just what you need? Affordable, convenient and organic. I’m obsessed. For another natural and delicious options, Acme’s Open Nature™ products shouldn’t be missed. With a large selection of choices with no artificial ingredients colors or preservatives including breads, snacks, ice cream and lots more. Open Nature offers meat options including grass-fed Angus beef, chicken, lamb and pork that are all vegetarian fed with no antibiotics or added hormones. Wonderful options for either that elegant holiday meal or clean weekday eating. While having lots of fun in the Acme kitchens we whipped up some super adorable mini vanilla and hazelnut whoopie pies. 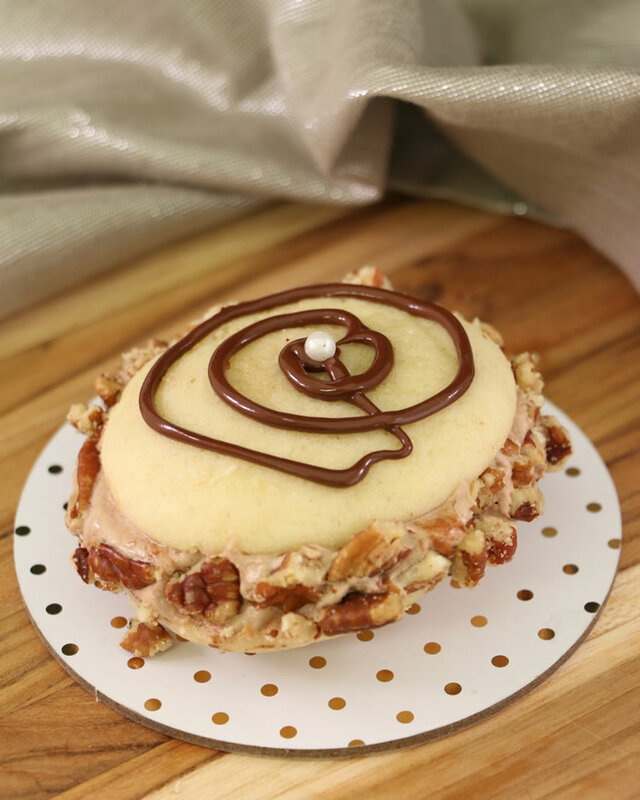 So yummy and an incredibly simple sweet for the holidays. And the filling can be easily altered with a variety of flavors. 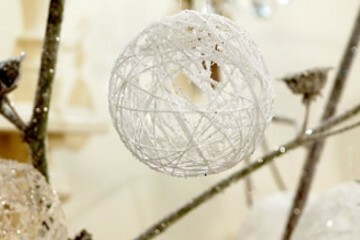 For a little holiday glam, we decorated them with Acme’s melted O Organic’s Organic 51% Semi-Sweet Chocolate. It’s such a decadent and delicious high-quality chocolate that’s great to keep in the pantry for those times you need something with a little chocolate. Or a lot. Plus it’s organic so how great is that? As an added bonus it’s also dairy-free. I knew this delicious O Organics chocolate would be amazing with our recipe for Holiday Kettle Corn Bark. Did you know O Organics also carries an organic Kettle Corn? Yup, that’s right. 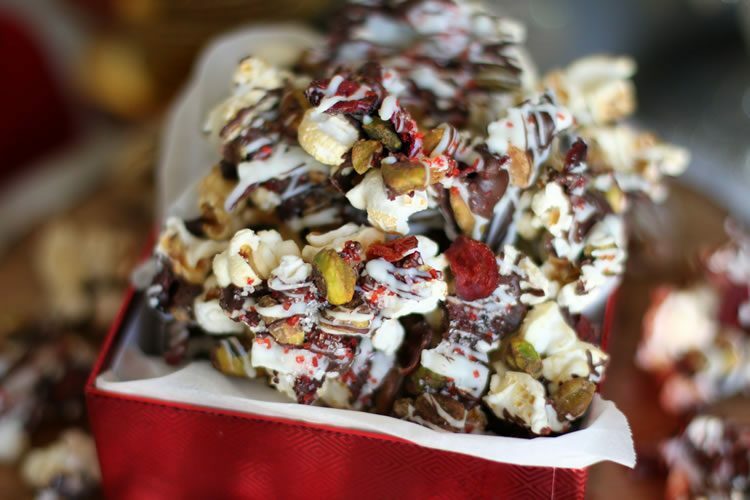 Here we take O Organics Organic Kettle Corn, toss it with pistachios and O Organics Organic Dried Cranberries. Yay for more organic! We then drizzle it all with melted O Organics 51% Cocoa Semi-sweet Chocolate and white chocolate. O Organics Organic Coconut Oil is added to the chocolate just before melting to give it a little more viscosity while drizzling. To melt the chocolate you can use the double-boiler method where a heat-proof bowl is placed over a pot of simmering water. To save time we microwaved our chocolate at 30-second intervals. Be sure to stir well and don’t overheat the chocolate or it may burn. If using white chocolate that comes in a bar, break it into small pieces to ensure even heating and melting and to reduce the chance of any burning. 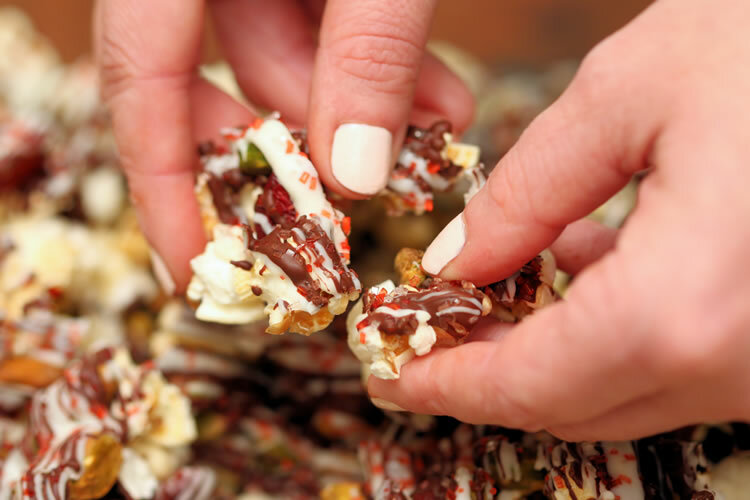 To finish we sprinkle it all with a little decorative sugar for some holiday flair and touch of sea salt for a sweet and savory holiday candy bark that everyone will love. You can easily substitute almonds, cashews or dried cherries. The O Organics Organic Kettle Corn featured in this recipe is wonderful if you’re looking for a kettle corn that isn’t too heavy on the sweet. Just a hint. That way all the flavors stay balanced and all you’re left with is a delicious holiday candy bark that’s a little bit sweet and a little bit salty. Plus it’s organic which is not easy to find. If you like a darker chocolate look for the O Organics 72% Cocoa Dark Chocolate Chunks. Holiday perfection! If you’re on the coconut oil kick like I am trying the O Organics Organic Coconut Oil. I love that it doesn’t have that overpowering coconut smell like other brands I’ve tried. Sometimes when cooking you want all the benefits of coconut oil without the coconut essence overpowering your dish. The O Organics Organic Coconut Oil is thick and creamy with all the coconut oil benefits while staying neutral. Love it. It would even work great in some natural home beauty recipes. O Organics products are available in my area exclusively at ACME markets. That’s where I get mine. But you can also find them at all of the Albertsons Companies family of stores, including Albertsons, Safeway, Jewel-Osco, Vons, Pavilions, Randalls, Tom Thumb, Shaw’s, Star Market, United Express, United and Carrs/Safeway. If you haven’t tried the O Organics line I think you’ll be hooked once you try it. With so many products to choose from at a great price point what’s not to love? It’s pretty awesome when you don’t have to break your budget and still be able to stick to a natural and organic lifestyle. ACME Markets believes that great-tasting organic food should be accessible and available to everyone at a great value. And I think they’ve achieved their vision. You should be able to find the organic kettle corn in the snack aisle and the organic chocolate in the baking aisle. And if you can’t find something you’re looking for, please just ask. At my local store, I was looking for something and I was so impressed how one particular employee was basically running all around the store helping me find just what I needed. He was so friendly and genuinely concerned I found the ingredient I was looking for. It was so refreshing. That type of experience combined with such an amazing selection of natural and organic products is why I keep coming back to shop at Acme. Also have you ever popped into Acme’s floral section? If you haven’t you may have never noticed but there’s a bit more there than just flowers. Acme also carries a full line of vases, candles, home and tablescape accessories by debi lilly designs, which is exclusive to their stores. If you haven’t heard of Debi Lilly, she’s a celebrity event planner whose clients include Oprah, Harry Winston, People Magazine, Cartier and Louis Vuitton. Not too shabby at all. We met Debi Lilly at the recent Acme holiday event where she showed us how easy it is to make living life a little more beautiful and glamorous. And it doesn’t have to be expensive. 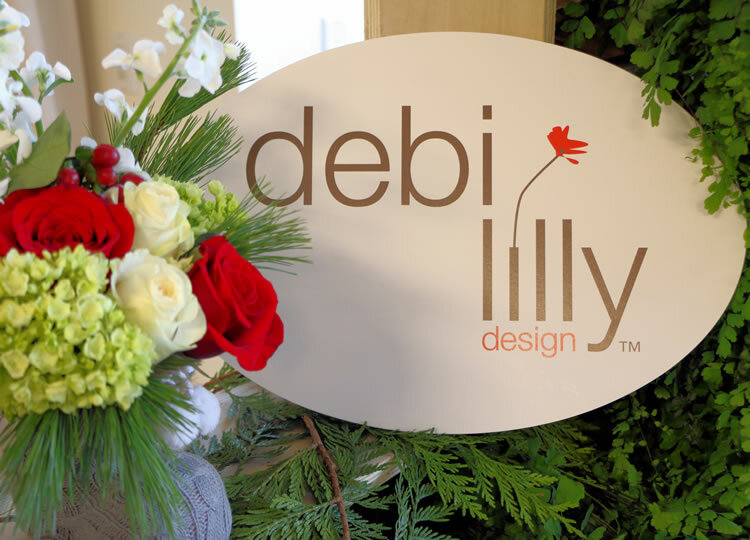 debi lilly design products are not only super adorable and on trend but really affordable. It also couldn’t really get more convenient. Having some friends over for dinner or want to spruce up your holiday table? 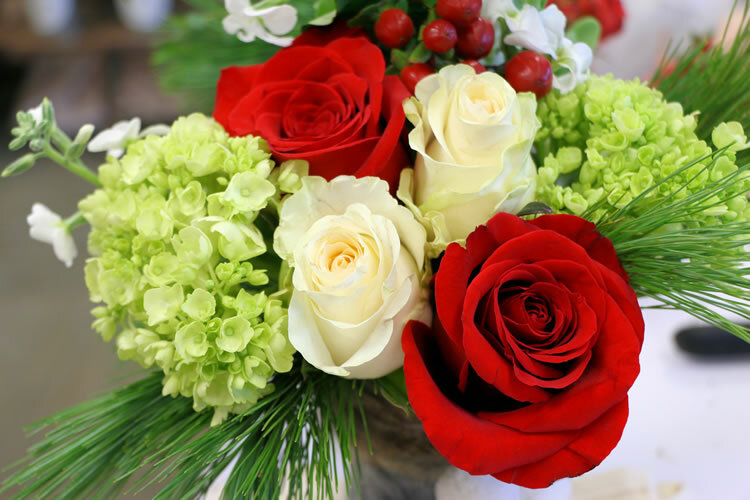 Pop a vase and pre-arranged bouquet of flowers and maybe a gorgeous scented candle or two into your grocery cart while you shop for ingredients. 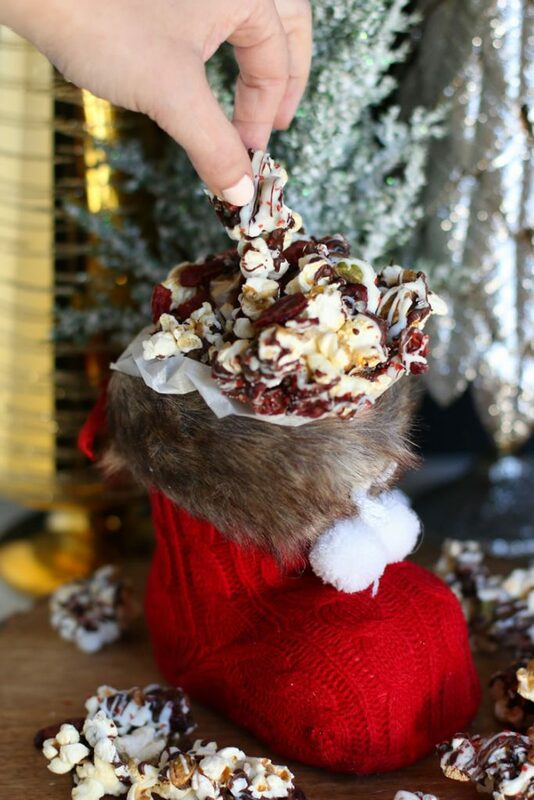 We even got this adorable debi lilly sweater boot vase currently available at Acme and filled it with our Holiday Kettle Corn Bark. How adorable? 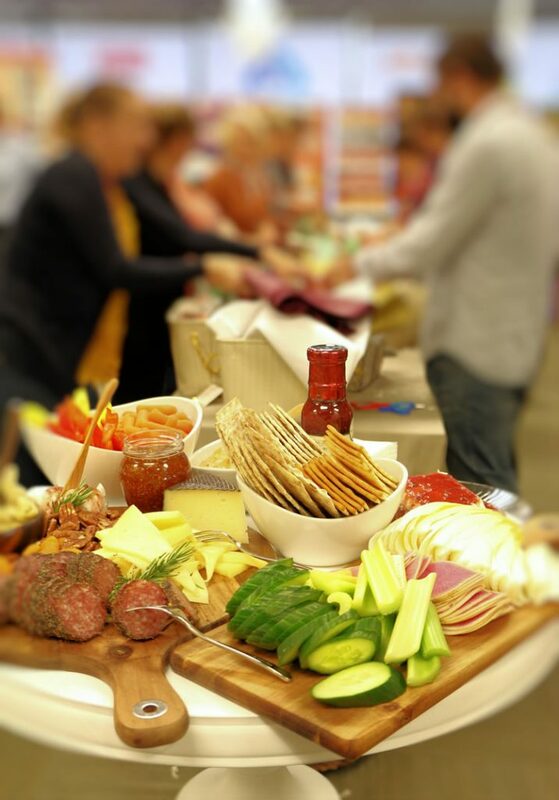 So this holiday season whether you’re whipping up a big family feast, baking up some delicious treats or simply putting some finishing decorative touches on your holiday dinner ACME Markets has everything you need. 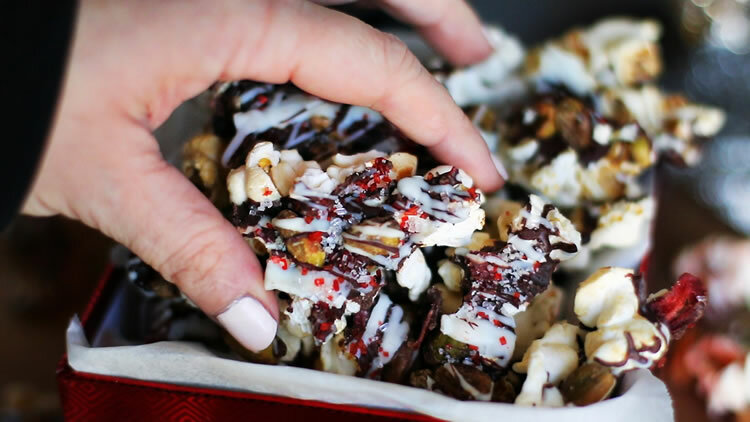 Perfect for a dessert table or bagged as gifts for friends and family, this holiday kettle corn bark with dark and light chocolate, cranberries and pistachios is a yummy holiday treat that couldn't be easier to make. Line a 12x 17-inch baking sheet with wax or parchment paper. Spread kettle corn on the lined baking sheet in one thin single layer. 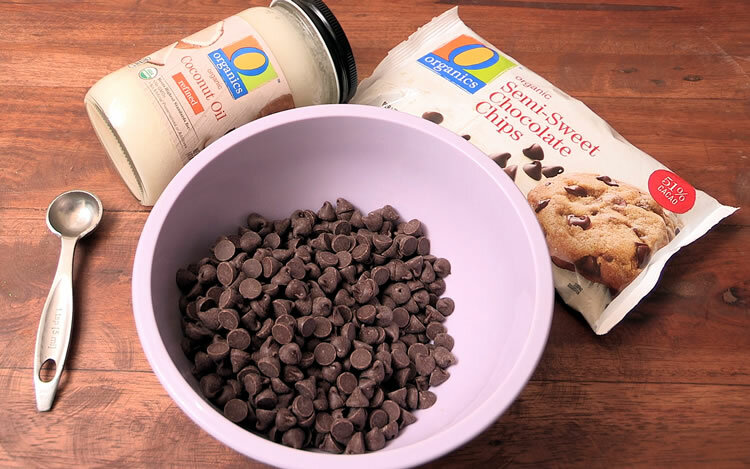 Melting The Chocolate - Put the semi-sweet chocolate chips with 1 tablespoon coconut oil in a microwave-safe bowl. Microwave in 30-second intervals, mixing the chocolate well in between until melted and smooth. Don't overheat or the chocolate will burn. 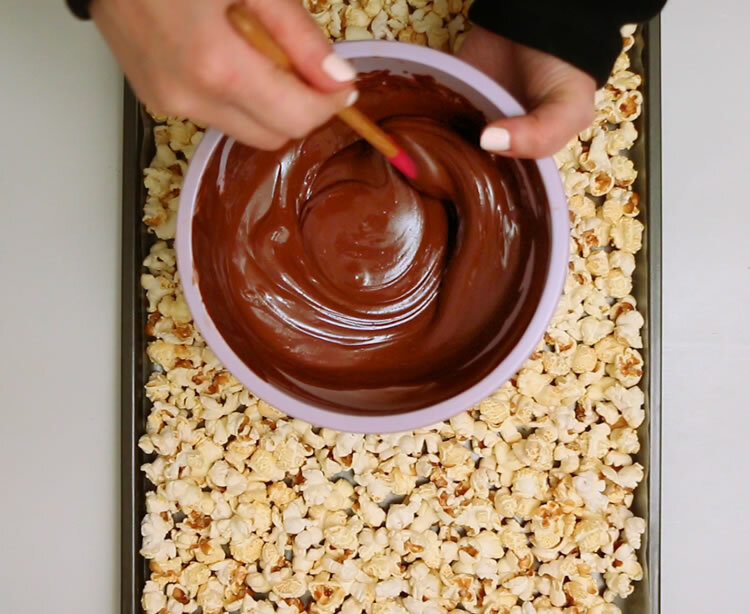 Drizzle the melted chocolate evenly over kettle corn reserving about a 1/3 cup for finishing touches. Then sprinkle the pistachios and cranberries over the kettle corn evenly. Melt The White Chocolate - follow the same instructions as above and then drizzle evenly over the kettle corn. You can follow with any remaining semi-sweet chocolate for a layered effect. Let the kettle corn stand for 5 minutes. Optional: Sprinkle with decorative sugar. You don't want to chocolate to be too wet or the sugar will melt into the chocolate and not look too pretty. Place the kettle corn bark in the freezer 10 minutes to harden. You can also let it stand at room temperature. It will just take longer. Once the bark has hardened, break into pieces. It's nice to have some big and some small. 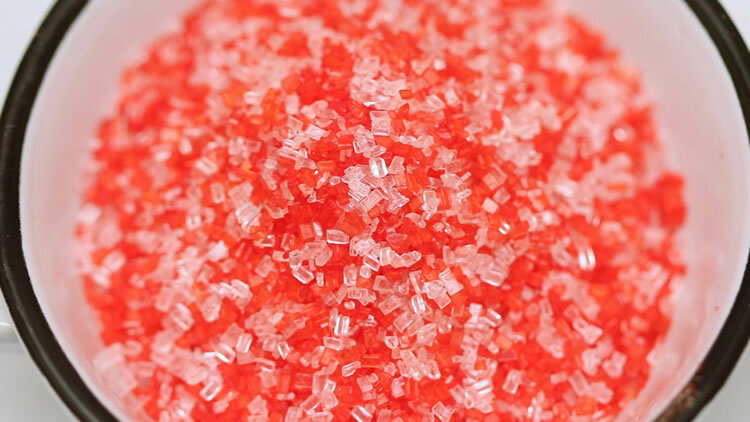 Finish with a sprinkle of sea salt. 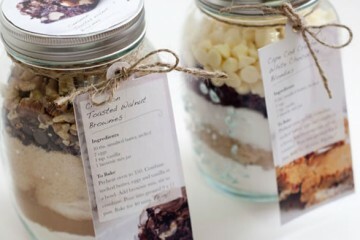 Store in an airtight container or pack up in sealed bags to give as gifts.